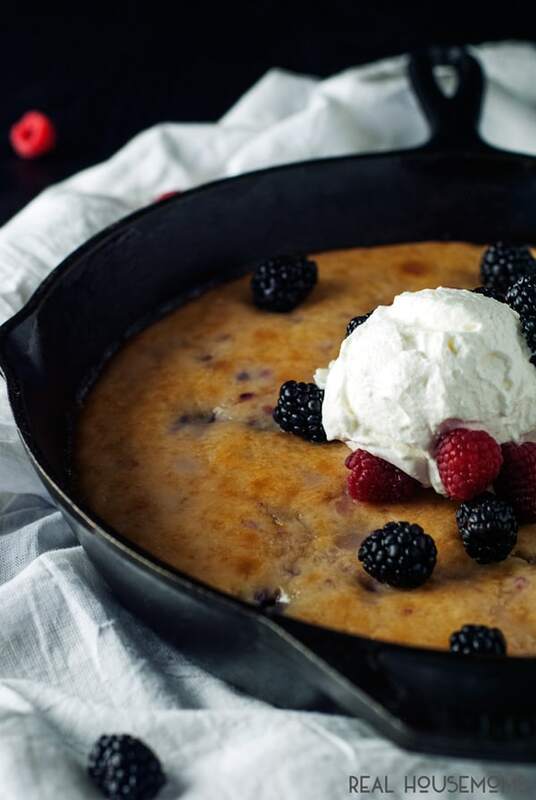 Ready in minutes, this EASY BERRY SKILLET CAKE is packed full of flavor and sure to satisfy that sweet tooth! You guys. This cake right here. You see it, hanging out in that skillet, looking all awesome? Well, that’s because it is awesome. Seriously, it’s like the best cake I’ve ever made. And it’s a perfect size too, when you’re trying to cut back on all those sweets. You don’t have to feel bad about three-layer cakes that you want to finish but don’t want to finish because zomg that is so many calories but so delicious but one more slice won’t kill me omg why am I eating this?!?! As a dessert lover, the simplicity of this treat makes me giggle in delight. You don’t need ten tons of butter or ten thousand cups of flour and sugar. You don’t have to wait for it to cool before glazing, and it looks pretty enough in its pan to please anyone. This dessert is totally chill, yo. 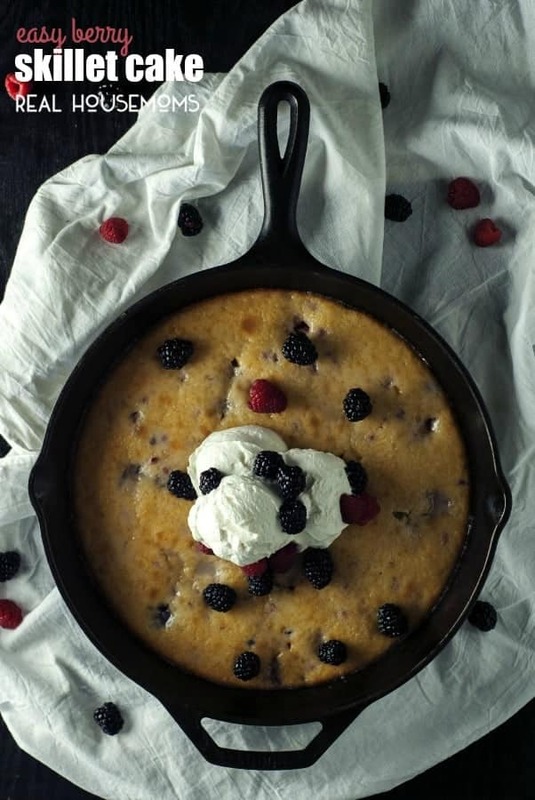 My biggest tip for success with this easy berry skillet cake is using super soft butter. I’m talking butter than is like…one step away from being melted. Not just simply softened. If you use butter that is just soft, you’ll end up with a cake that is stiffer in texture, and we want something that pretty much melts in your mouth when you eat it. So use butter that is nearly melted. I tend to leave my stick sitting near the stove while it’s preheating, that will get it nice and ready for this cake. 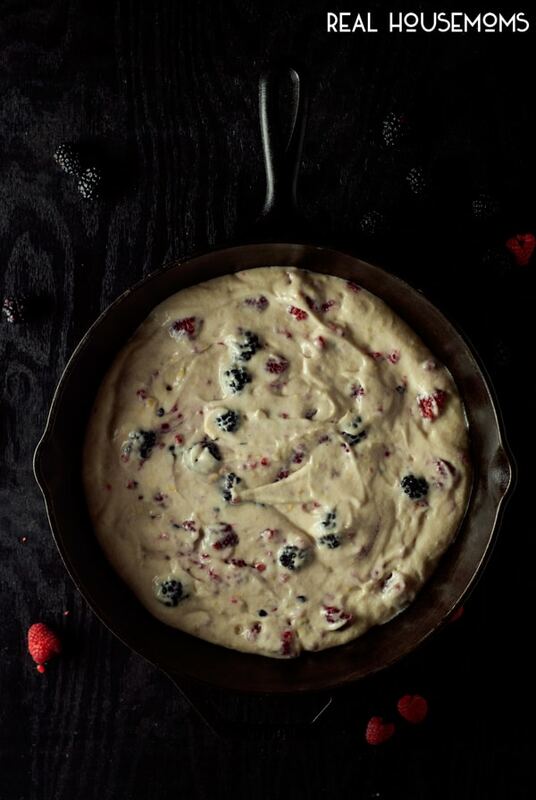 I also like to smash the berries into the batter, rather than simply folding it in. That way there are little chunks of berry goodness throughout the whole cake! Preheat oven to 375 degrees. In a medium bowl, mix together the flour, baking powder, salt, and lemon zest. Set aside. In a mixing bowl, cream the butter and sugar until fluffy, around 3 minutes. Beat in the egg until thoroughly incorporated, followed by the vanilla extract and lemon juice. Slowly mix in the milk. 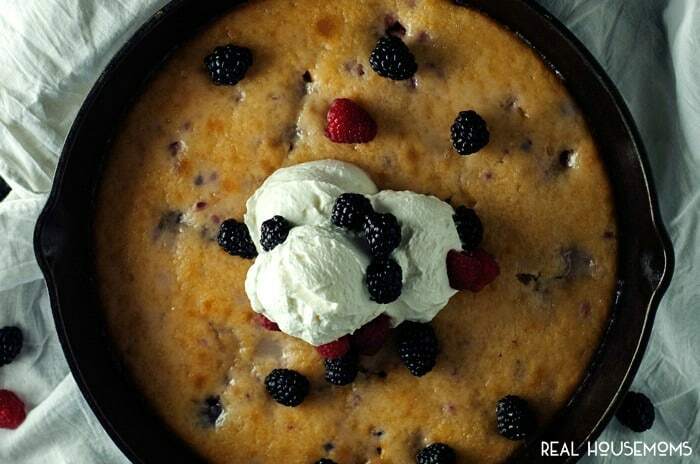 Add the flour mixture and stir until combined, then dump in the berries and beat for an extra minute. Pour the mixture into a 12 inch skillet and bake for 25-30 minutes, or until golden brown on top and a toothpick inserted into the center comes out clean. In a small bowl, whisk together the powdered sugar, vanilla, lemon juice, and the milk until smooth. Pour onto the cake, then serve. Oh darn it. You can certainly try it on the stove it’s just something you’ll have to keep a watchful eye on.